Hi All! 👋🏼 we have tons of dresses that we are selling for really affordable prices for weddings and other formal occasions. We take appointments if you want to come by and see what we have/how the dress fits. 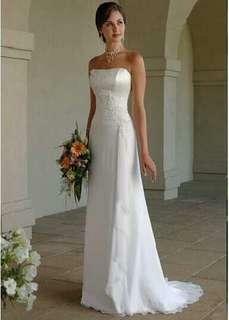 Strapless wedding dress with embroided details and a corset back. It is light and comfortable and a simple yet elegant design. We have many sizes available please contact me for inquiries!